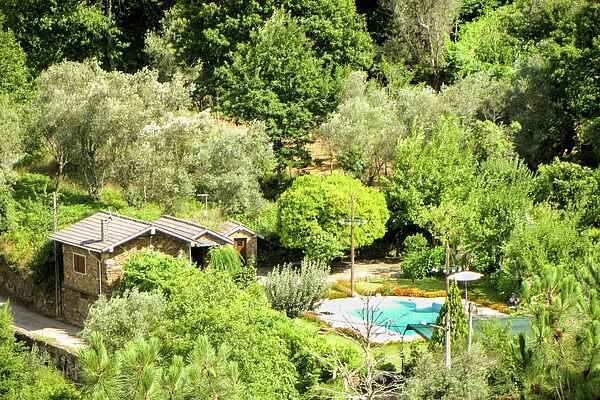 Authentic Portuguese holiday house with private swimming pool, located in a large vineyard. The detached holiday house is situated in a valley nearby a river. This small holiday home offers an ideal stay for a couple. It is decorated simple in Portuguese style, with a lot of wooden accents. The garden (ca. 5000m2) with a lot of fruit trees, the lawn and the swimming pool purified by salt water are all for private use and offer a lot of privacy. From the different terraces surrounding the house, with a BBQ, you can enjoy the beautiful view over the valley. The environment offers everything for an enjoyable holiday. At only ca. 10km you can find the termal cities of Carvalhal and S. Pedro do Sul (explored by the romans since the 1st century. At 50km is situated Portugals highest mountain Serra da Estrela and also the river and nature offer a wide range of leisure activities. The small villages like Reriz are undiscovered and worth a visit, as well as the city Viseu (ca. 54km). Other activities and things to visit in the surroundings; - Nature reserves where you can enjoy all kind of activities from radical sports to walks in the the nature. - City of the Lusitania hero Viriato, who fought the romans. -In Viseu (ca 42 km from the property) The Grão vasco Museum (a Portuguese painter from Renaissance), parks from teh romantic period, old train rail transformed in a bike path (Ecopista do Dão) 48km of bicicle path in the nature. Golf course (Montebelo), churches and night life. - In S. Pedro do Sul (ca. 31km) Bioparque, a nature reserve in the mountain where you can spend the day, activities for children and adults, walk paths in the nature. - In less than 50 kilometer's you will find Serra de Arouca, with geopark Arouca, with two important geosires: the Canelas Slate Quarry and its on-site Museum, and the Castanheira Nodular Granite, with a phenomenon popularly known as pedras parideiras (“rocks delivering stones” - weathering) - Reriz is 40 km from Lamego, where you can start the Douro exploration.